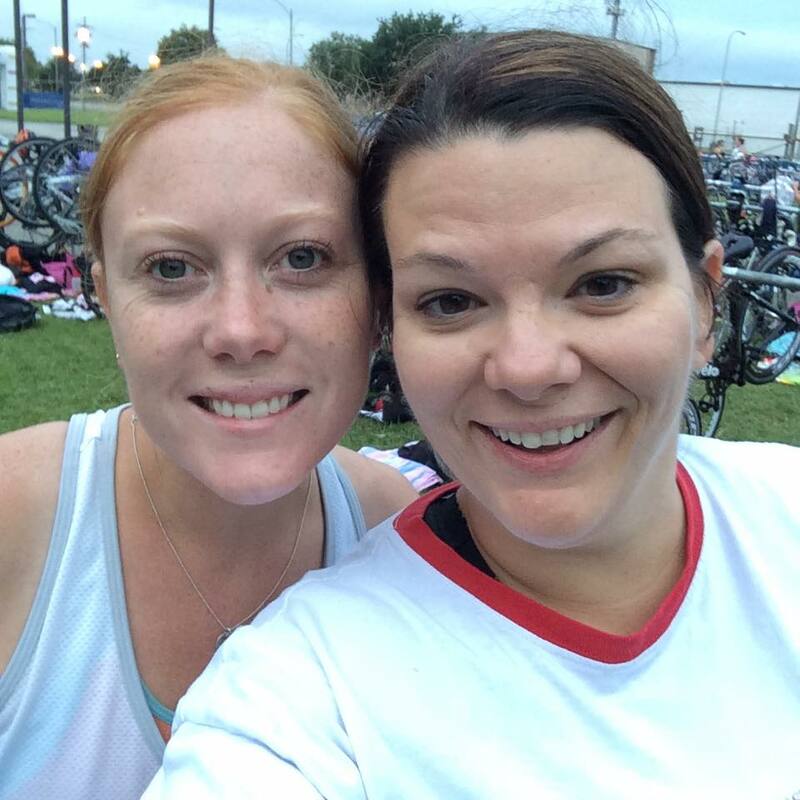 This morning, Heather and I got up in the middle of the night to drive to Baton Rouge for our second Rocketchix triathlon. Honestly, neither of us had done much training so we were kind of not sure how we’d end up doing. There were a lot fewer participants this year than last year, so it didn’t take nearly as long to get in the pool. And I’m happy to say that while I wasn’t swimming particularly fast, I also didn’t panic and flail around like I had in the past. I even passed a few people! Once out of the pool, I got through transition pretty quickly, and I was on my bike (with the seat set at the proper height) before too long. I get so focused on the swim for these races that I forget that being on a bike for 12 miles is…kind of boring. I am using George’s bike, which is not exactly meant for speed. But the bike portion also went better than last year. 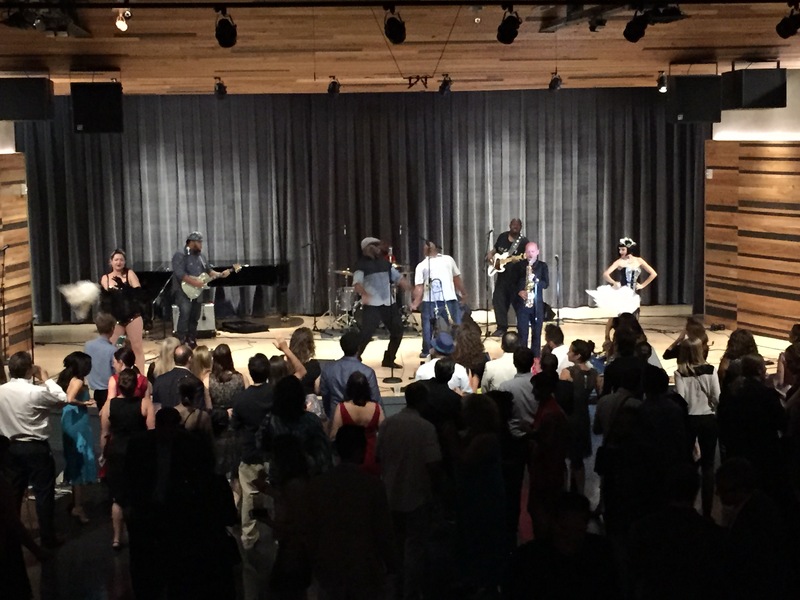 I got into a groove, and it went by pretty swiftly. (Well, swiftly for me.) I even passed a few people! That’s a first for me. The next transition was easy – just throw off the helmet, really, and I was off and running quickly. Well. “Running.” Only two miles. That’s nothing. But it seemed to last forever. I ran when I could (not much) and walked a lot. Selfie during the run! Mike the Tiger is somewhere back there. I was looking at my watch a lot, hoping I could beat my time from last year, even taking into account that the swim was nearly twice as far this time. I wasn’t even daring to hope that I could beat my run time, since my legs were just worn out and it was pretty hot. Finally, the finish line was in sight, and I was done, with Heather and Tee and her sister and my friend Jane cheering me on. Woot! When I picked up Heather this morning, we realized we bought matching shirts at Academy yesterday. Aren’t we adorbs? Now, the important part. How did I do? Transition 1: Last year was 5:12, this year was 3:15. Nearly two minutes shaved off! Transition 2: 1:40 last year, 1:29 this year. Run: I was positive this was going to be at least a couple of minutes slower. I was stunned to see I finished the run faster! 23:44, compared to 24:06 last year. Woot! Finish time…10 seconds faster than last year! So overall, a pretty good race. But you know, I think I’m done with triathlons. It’s not triathlon’s fault. I am never going to improve a ton at swimming, and I’m not willing to invest in a faster bike for that portion. I could probably get faster at running, but I already run races, so I think I’ll just stick to that. I may have committed to running a half marathon in October, even though I’d sworn them off. Ha! We’ll see. 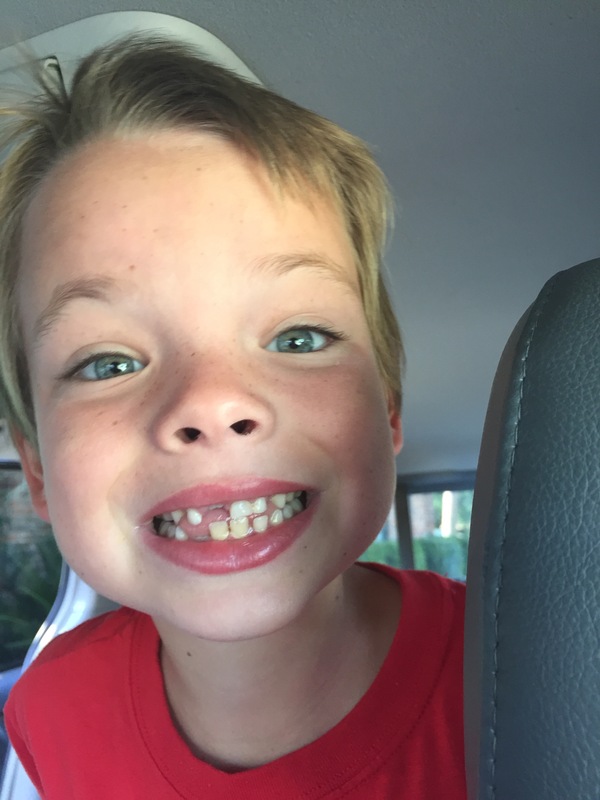 Oliver lost one of his top teeth, finally! Poor dude was getting a complex about it. Woke me up at 1am to show me. Glad he didn’t swallow it in his sleep! Looks like the adult tooth is already coming in. Today a company is coming by to give us an estimate on having the attic insulated. Hopefully we can afford to do it, because I imagine it would pay for itself in a couple of years. Upstairs gets so, so hot. Anyone have experience with this? Our a/c is just struggling to keep up with the heat. I also am scheming to get the living room in order. Painting, first of all. And then just making it look a little nicer. Maybe it’s time to take down the baby gate at the top of the stairs? I dunno if I’m ready for that. Here’s what it looks like currently. At least I moved the lego table into the boys’ room. It’s a start. Oh shoot. Two days til the triathlon. Better start thinking about that. Kristina and I tried out this new food market the other day before she went back home. 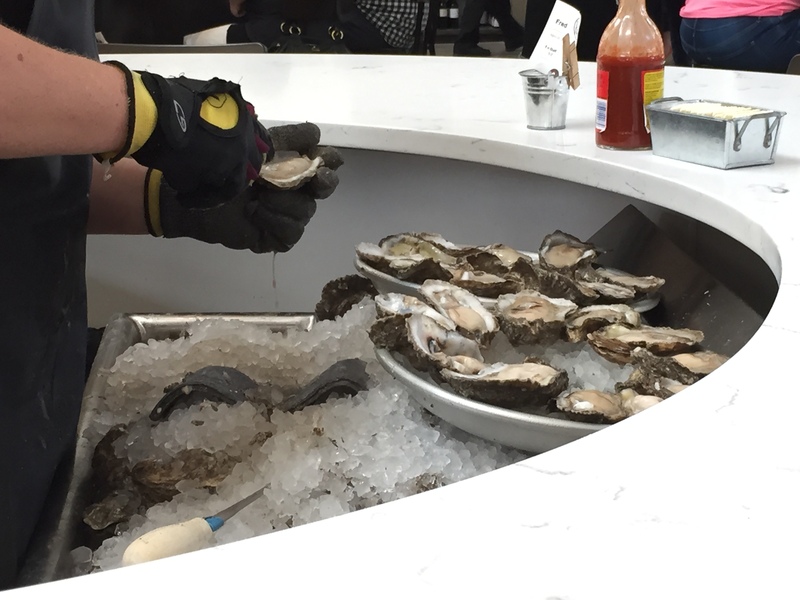 We had some really delicious raw oysters, a cheese board, a salad, and a crepe stuffed with macaroni and cheese and pulled pork. I mean, yeah. It was good. I may have hit the open bar a few times, because by the time we left, I had a fancy bottle of wine from one raffle and I’d outbid everyone for some hair salon services in the silent auction. It’s all for a good cause, at least. Sunday was a really big day, actually. 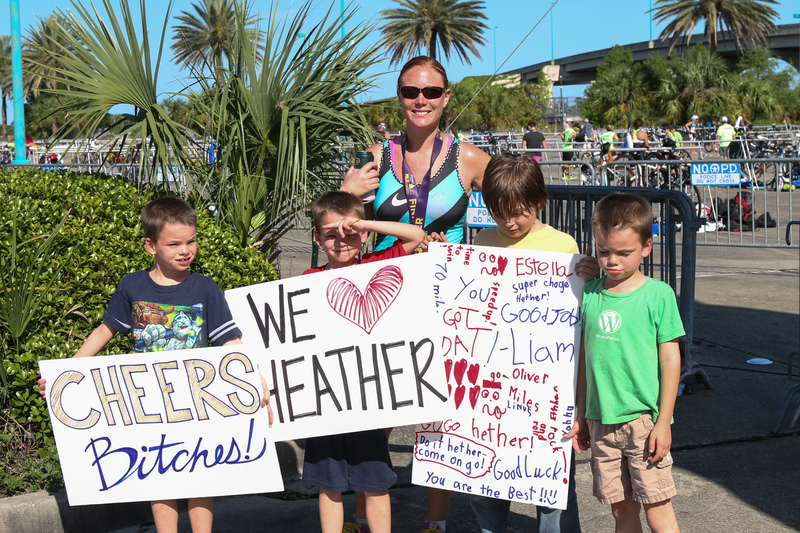 Between the garage sale and the school fundraiser, we also went out to cheer on my friend Heather as she finished her first half Ironman triathlon! Well, I should say we attempted to cheer her on. Thanks to some gross ineptitude by local organizers, the website said the race finished at City Park. But no, it actually finished several miles away at the lakefront. By the time we finally go there, she had already finished. 😦 I was so upset about it, and really freaking angry at the organizers. I wonder how many other people missed seeing finishers? On the bright side, I almost got to see fellow identical triplet mom Kim close to the finish line. You may remember me posting about her husband, who was killed last year in a training ride for this very same triathlon. She decided to train for it and race it in his memory. So inspiring. 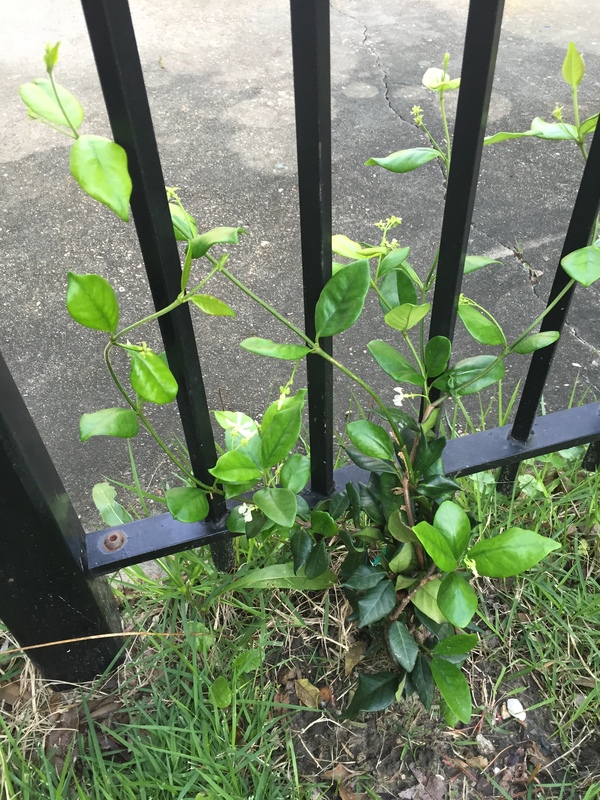 In horticultural news, a couple of weeks ago, I planted some jasmine along our iron fence. We only have a side yard, so hopefully this will add some privacy as well as some beauty and nice scents. And probably bees. And it’s already growing! I don’t know how much I am supposed to nudge it along the fence, but it seems to be doing okay. I guess it’ll be a few years before the fence is covered, but it’s fun to watch the progress now. On the other hand, the Bradford pear I planted when we moved in eleven years ago has some weird black spots on the leaves, which also look like they’ve been eaten. I need to figure out what to do about that. Remember when my friend Matt got very very sick about five years ago? Well, the husband of another mom of multiples is currently very ill with the same kind of situation. A flesh eating bacteria. Matt pulled through, and I’m confident Melissa’s husband will as well, but they can use all the positive thinking (and other support) we can send their way. I remember Alicia saying that Matt did as well as he did because he was a rugby player, so big and muscly and solid. Melissa’s husband Josh is a police officer, so similarly brawny, so I think this is a good sign. Keep them in your thoughts. Next week, the boys and I are headed to Virginia for Emily’s first communion. A plane ride with all three – hopefully I won’t get barfed on this time. Hmm. Finished my first triathlon today! I was never super sure about doing a triathlon, mostly because of the swimming. But as I’ve probably posted a jillion times, I’ve been training over the summer and have been feeling pretty confident about my swimming. So then I’d get nervous about the bike ride, or maybe the run (or more accurately doing the run after swimming and biking.) I’m going to recap the race here, along with some tips and tricks so I’ll remember them for next time. I did the race with my friends Heather and Maggie (well, we all did it today, not exactly together) and we drove up to Baton Rouge from New Orleans last night to stay at my mom’s house. On the way there, we stopped for dinner at a Mexican restaurant. Tip #1: Don’t eat Mexican the night before a big race. I’m not saying it caused any major issues for me, but it just wasn’t the best choice. We go to my mom’s, went to bed fairly early, and were up at 4:30 a.m. Got dressed, hit up Starbucks for a bagel and coffee, and got to the race area in good time. Picked up our numbers, got our stuff together, racked our bikes. On the advice of a friend, we put our stuff in crates so we could sit on them during the transitions. After getting all set up, we found Teresa, who came to cheer us on and take pictures. Tip #2: Bring your own paparazzi. Especially if you like seeing pictures of yourself in spandex. It was time to go get in line for the race! Everyone got in groups according to when they anticipated finishing the swim. Since Heather is a former swimming champ, she was way at the front, and Maggie and I were closer to the back of the pack. I was pretty confident in where I seeded myself. It was a little slower than I could do, but not too bad. So it’s time for me to get in. I’m strangely calm. I knew I could do this. I get in the pool, and off I go. And…I feel awkward. I can’t get into a rhythm. My foot cramps up. I feel like my ankle chip thingy is too tight, causing this foot cramping. Tip #3: Don’t put on your ankle chip thingy too tight. Maggie started just after me, but passed me. I don’t know why, I just am not doing great. I am doggy paddling. I’m breast-stroking. I’m doing it all wrong. I feel bad – did I seed myself all wrong? There are other swimmers (doing about as well as me) clumping up around me. We pass each other a few times, and thankfully, before too long, I’m done with the swim. I go to the transition area, and sit down to dry my feet off, put my shoes and socks and helmet and number on, and get my bike off the rack. The damn crate is in the way. But I get the bike down, walk to the bike start and off I go! Almost immediately, I know something’s wrong. See, the day before, I’d picked up George’s bike (that’s what I was using) from a tune-up at the bike shop. And here’s where I made a big mistake. I didn’t even get on the bike until this very moment. And I discovered that the bike shop must’ve moved the seat all the way down. Tip #4: Always get on the bike before the race. Duh. I could barely straighten my legs, and I felt like Donkey Kong with my knees practically up to my ears. Or that’s how it felt. I got passed a lot. I only passed one person during the entire 12 mile ride, and she passed me again at the end. But once I hit the halfway point, I was in decent spirits again. Everyone was so supportive of each other, and it was a beautiful day. I mean, for July in Louisiana. I finished the bike and was happy that my legs weren’t too jelly-like. I had done a few “brick” workouts (triathlon-speak for a bike-then-run so you can get used to the feeling) so maybe that had helped. Or maybe doing slow did. Who knows, but I was pleasantly surprised. But I was getting nervous about the run. I just didn’t wanna. I don’t run outside in the summer. I just don’t. And I was about to have to do it. Got to transition, dropped off my helmet, and headed out on the run. I felt like I was going incredibly slowly. I walked and ran, not really worrying about my time. Just wanted to finish. The run course was a little shady, which was nice, and it was also great to see Teresa (and Heather, who’d finished long before) cheering me on. When I got to the turnaround, I had the best-tasting cup of blue Gatorade of my life. And really, before too long, I was at the finish! I high-fived some random kid, and got my medal and stuff. Woo! Love medals. Found everyone and of course we posed for a pic. Tip #5: Get a bucket instead of a crate. It has a handle. We were able to get our official times, and I was so excited to see I placed ninth in my age group! (In my bike’s division.) (Okay, it was out of 14. But still.) And while I didn’t really have a goal time (honestly, I had no clue how long it’d take, but as the race went on, I was shooting for under 1:45) I was thrilled to see my chip time was 1:37! Everyone said I’d be hooked after my first triathlon. I’m not entirely sure I’m hooked yet, but I definitely want to try again, knowing what I now know. I know I can get faster times in transition, and I know I can bike faster. In cooler weather, I’m sure I can run faster too. It’s too bad all of these sprint triathlons are different lengths, so it’s hard to compare apples to apples, but at least I can get my pace up. This was a great beginner’s race. I didn’t feel terribly intimidated by the other athletes, and we talked to some great ladies in the line waiting for the swim. I think I’m going to have to try just one more, and then I’ll see if I’m hooked. There’s one in September (another all-female race with similar distances as this one) that I’ll probably do. I do love that I wasn’t just running the whole time. I’ve already said my half-marathon days are over, and I stand by that. So we’ll just have to see if triathlons take their place. The only photographic evidence of my swimming you will ever see. When I signed up for this, I was very nervous about the swim. Now I’m feeling pretty good about the swim (it’s amazing how fast you can improve with swimming) and it’s the run I’m nervous about. Funny, considering I’ve completed two full marathons, 11 half marathons, and dozens of shorter races. But I’ve never done one after swimming and biking for an hour. At least the run is only two miles. And even if I walk it won’t take that long. I’m not looking forward to wearing so much black spandex, though. Shudder. If anyone wants to come cheer us on at the end, that would be great! Just remember. No pictures. I’ll be thinking of the Guinn girls as I finish this race. Girl power! This is never, ever going to be me. 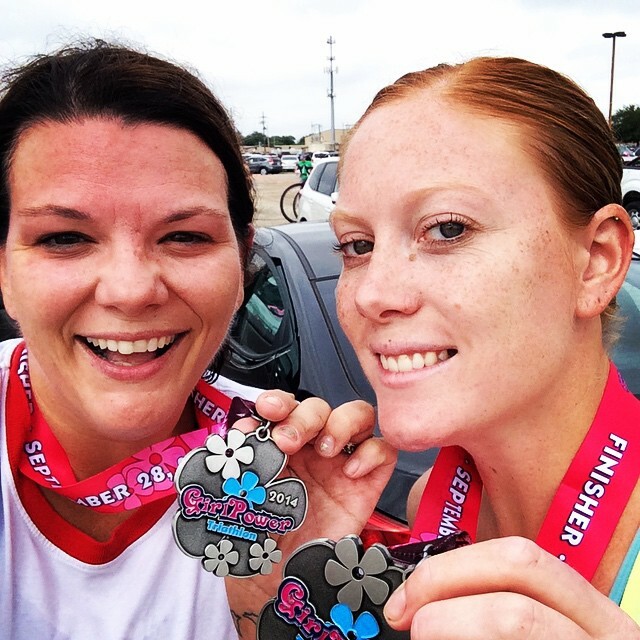 After my last half-marathon, I vowed never to do another one. I just am kind of bored with long distances, and the weather here is too unpredictable (by which I mean, it might be too freaking hot even in October) so since I’m not really getting much enjoyment out of them, no more. I think eleven is plenty, don’t you? My friend Heather suggested we try a duathalon, and I briefly considered it until I realized how ridiculous I’d look trying to cross the Mississippi River bridge twice on my pink cruiser. Plus, it was in June, and I don’t run outside between March and September. So then she suggested a sprint triathlon, and okay, I caved. I’m curious. I’ll try it. So we’re going to be signing up for one next month in Baton Rouge. Yeah, that’s right, in July. It’s 200 yards in a pool, 12 miles on a bike, and a 2 mile run. 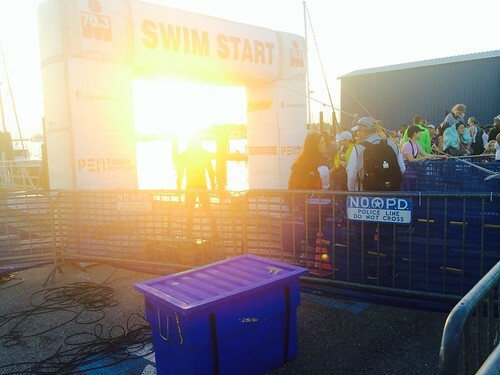 I know I can do the bike, I’m sure I can do the run (though I know I’ll have to practice running after biking), but the swim…that makes me nervous. Oh, and did I mention it’s in July? This seems insane. The only reason I agreed to this particular race is because the swimming portion is in a pool. I have never liked natural bodies of water, especially the stagnant lake type. No freaking way will I ever do a triathlon that involves open water swimming. I’m declaring that now, and I can pretty much guarantee that is not going to change, ever. So yeah. Heather and I went to the pool this morning, just so I could get an idea of how my swimming skills are. Yeah, not so good. I flailed my way through two lengths of the pool before basically wanting to pass out. What the hell? I can run five miles, but swim 50 yards? Forget it. I was a doggy-paddling mess. It’s gonna be ugly. I’ve already done some reading over at Swim Bike Mom (awesome blog!) but if anyone has any tips or advice for me, feel free to share. Please.